Hello friends. Well, here I am with a brand new web-page. I had no idea I would ever have such a beautiful site but with the creativity of Iryna Spica, book designer, this wonderful web page has been designed. I hope you will enjoy it. 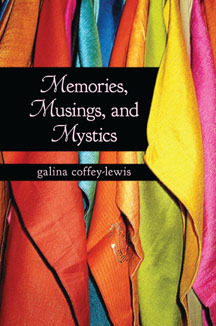 Memories, Musings and Mystics as a Free iBook and eBook is now available. Memories, Musings and Mystics is the culmination of my entire life’s experiences with spirituality, healing and musings on the healing journey of life. In this book, spiritual sayings are integrated into a healing journey for all who read it. Through the short, true stories and musings, the reader can meditate and gain more insight into their own personal and spiritual journey in life. This book will appeal to anyone with a spiritual inclination in life and give much room to muse and meditate on certain portions of the book. This is a timeless book which can be read over and over for new spiritual insights and thoughts. I hope you will enjoy this new book as I share these stories, reflections and spiritual thoughts. Also, I hope that a thought or a story will touch you in some meaningful way and give you joy, comfort and inspiration in your life. Come and join me on a spiritual, and healing journey. P.S. Please see SPICABOOKDESIGN.COM if you ever want a beautiful web page or book design that you will be very happy with. © Copyright 2010-2014 Galina Coffey-Lewis.